Grandson of the poet Henry, Earl of Surrey, who was executed by King Henry VIII in 1547. Son of Thomas, the 4th Duke of Norfolk. Godson of King Philip of Spain. His parents were Protestant, but his mother returned to Catholicism and helped hide priests. Married to Anne, daughter of Lord d'Acre, at age 14. His father was beheaded by Queen Elizabeth in 1572 when Phillip was 15. Grandfather of Blessed William Howard. Graduated from Saint John's College, Cambridge in 1574. Courtier to Queen Elizabeth at age 18. Earl of Arundel and Surrey on 24 February 1580. At the royal court he led a sinful and dissolute life. In 1581 he was present at the Tower of London during the proceedings against Saint Edmund Campion, Saint Ralph Sherwin and others, and they had a great effect on him. He returned to his home in Arundel to consider their faith and his own, and was reconciled to the Church on 30 September 1584. He planned to move abroad so he could practice his faith, but was betrayed by a servant, arrested on 15 April 1585, and lodged in the Tower of London on 25 April. He was interrogated extensively for a year, found guilty of treason due to being Catholic, fined £10,000, and returned to prison. During the wave of anti-Catholicism that swept the country in 1588, he was re-tried , found guilty of praying for victory for the Spanish Armada, and sentenced to death. He spent the next seven years in prison, praying for hours each day, eventually dying from general mistreatment. Martyr. 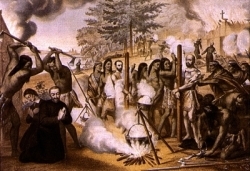 Two priests and six lay-brothers, all Jesuits, who were sent as missionaries to the area of modern Canada and New York, and who were murdered by the locals for their work. Born to a farm family. Ordained on 28 May 1972 in the archdiocese of Warsaw, Poland. Noted and vocal anti-Communist preacher during the period of Communist rule in Poland. Worked closely with the anti-Communist Solidarity union movement. When martial law was declared in Poland to suppress opposition, the Church continued to work against the Communists, and Father Jerzy's sermons were broadcast on Radio Free Europe. The secret police threatened and pressured him to stop, but he ignored them. They trumped up evidence and arrested him in 1983, but the Church hierarchy indicated that they would fight the charges; the false charges were dropped, Father Jerzy was released, continued his work, and was pardoned in a general amnesty of 22 July 1984. The Communists tried several times to kill him and make it look like an accident or anonymous attack, but they quit hiding their intentions, and the secret police simply kidnapped and killed Father Jerzy. Martyr. Consecrated herself to the Virgin Mary at age seven. Joined the Dominican nun at Langeac, France in 1623. Served as novice mistress, and then prioress of her house. 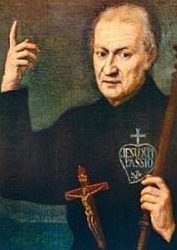 Spent three years in penance and prayer for the establishment of the seminary of Saint-Sulpice. Visionary. Ordained in 540. Hermit in Vaucluse, France. Pilgrim to Rome, Italy. Bishop of Cavaillon, France in 568. Godfather of King Theodoric II. His miracles, which included freeing a captive dragon and miraculously healing the foot of a nobleman, which had withered after the nobleman had kicked Verano for not delaying Mass as requested, are mentioned by Saint Gregory of Tours. Daughter of Prince Didan. 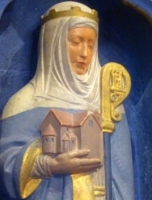 When a neighbouring noble, Prince Algar, as for her hand in an arranged marriage, Frideswide fled to Thomwry Wood, Birnsey, England where she lived as a hermitess. Benedictine nun. Founded Saint Mary's Convent, and served as its abbess. The monastery is now Christ Church College, University of Oxford, and the convent church became Oxford cathedral. Son of Elias and Matilda Hélye. School teacher and tutor in Biville, France and then in Cherbourg, France where he ran a school. A pious young man, he would fast several days a week. Pilgrim to Rome, Italy. Studied theology in Paris, France, and was ordained a priest there c.1236. Travelling priest and evangelist in the diocese of Avranches and Coutances, France, spending his days in ministry, his nights in prayer and penance, and spreading his own intense dedication to the Eucharist. Celebrates the supernatural life which Mary led on earth, particularly her advancement in grace and wisdom, in her intimate union with Jesus, her Divine Son, the Second Person of the Blessed Trinity. 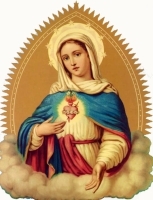 Saint Luke, in chapter 2, tells us Mary's manner of meditation, how she pondered on the words concerning Jesus and the words spoken by Jesus: "But Mary kept all these words, pondering them in her heart," and "his mother kept all these words in her heart." Married. Widow. Nun and then abbess at Cuteclara during the period of Moorish occupation of Spain. Killed by Muslim authorities for the crime of Christianity. Martyr. One of the Martyrs of Córdoba. The Estadio Santa Laura in Santiago, Chile, and the Humberstone and Santa Laura Saltpeter Works in northern Chile are named for her. Thomas Love Peacock wrote a ballad about her in his work Gryll Grange. Nephew of Saint Remigius of Rheims. Bishop of Soissons, France. Married. Aquilinus and his wife agreed to live by good works. When they moved to Evreux, France, Aquilinus's reputation for holiness was such that he was chosen bishop, but he lived more as a prayerful hermit than an active pastor among the people. Dominican novice and catechist. Martyr. Soldier in Upper Egypt assigned to guard a group of monks who were condemend to death for their faith. They led Varus to convert, and when one of the monks died in custody, he took the brother's place. Martyr. Born to the nobility. Spiritual student of Saint Samson of York in Brittany, France. Deacon. Served at the monastery of Taurac in Brittany until it was destroyed by the Franks. Hermit near Kildare, Ireland. Miracle worker. Monk at Worcester, England. Abbot of Ramsey Abbey. Bishop of Dorchester, England in 1006. Martyred by Danish raiders. Protested the martyrdom of Saint Ptolemy of Rome in the persecutions of Antoninus Pius. Martyred for his objections. His story was written by Saint Justin Martyr. Arrested and martyred in the persecutions of Antoninus Pius for the crime of teaching a woman about Christianity. His story was written by Saint Justin Martyr. Benedictine monk at Saint-Pierre de Longoret Abbey in France. Spiritual student of Saint Sigiranus. Hermit in La Brenne, France. Minor Old Testament prophet. Author of the canonical Book of Joel. Nothing is known about the man or his life. Monk and then abbot at Carmery-en-Velay (Monastier-Saint-Chaffre). Martyred by invading Saracens. One of a group of 59 Christians martyred together. First century missionary bishop. Founded the churches of Orleans and Chartres, France. Fifth-century bishop of Salerno, Italy.